Race Traits: Hair colors range from light shades of blues and purples to dark, and occasionally black. Some Aendaean have constructed wings of metal that they use to fly. 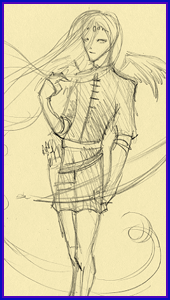 Lifestyle: The counterpart to the "primitive" Rocquoal, the Aenda are highly intelligent, master tacticians. At times they are too much of a know-it-all and can lack in common sense. They prefer to stay out of the battles, supervising from afar and plotting up new movements. The large cloud cities belong to them, but are open to any of the other races who would wish to take part in their knowledge. Aendan cities have the highest amount of technology of all the races - and their knowledge is far more advanced than our own. Fighting Style: they prefer not to get their hands dirty - so if they are unable to supervise, they will use a bow. Shadow Tolerance: it depends on the individual.